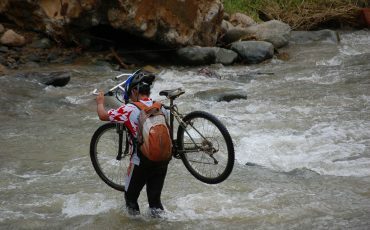 Challenge yourself and join this magical multi-sport adventure tour on the Ecuadorian mainland! The largest biodiversity on earth and the richest geography are located along the Equator line. Thus, there are many different activities you can explore. Undertake an excursion that offers mountain biking down the slopes of the eastern Andean Mountain Range with great views of the active volcano, hiking the colorful Andean “paramo” , and river rafting on the Jatunyacu River as well. Additionally, relax and soak in volcanic hot springs of Papallacta at the end of the trip! Upon arrival in Quito you’ll be met and transferred to your lodging for your first night in Ecuador. Depending on arrival time, you can spend your day exploring the old town of Quito and the surrounding area. Soleq.travel can help you to organize a day trip the surrounding areas, please do request in advance. In the evening, your trip leader will meet you at the hotel’s lobby for a welcome briefing at 18:00 hours, and there will be plenty of time to discuss details and questions you may have regarding the adventure. The first day is an informational and acclimation day. 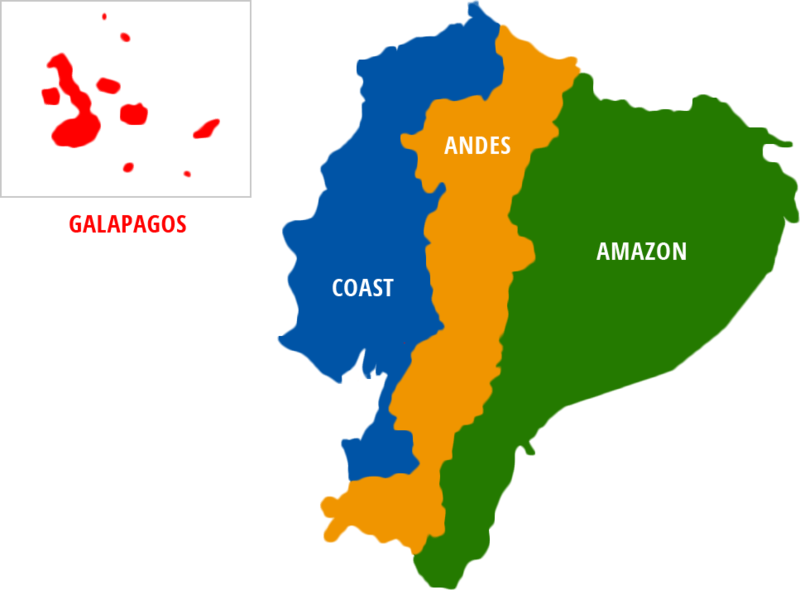 In the afternoon we continue our drive towards the Llanganates National Park, which is known as the sacred mountain, until we reach the town of Baños, located at the entrance of the Amazon. Here we can enjoy the best night life by drinking cocktails and dancing salsa. 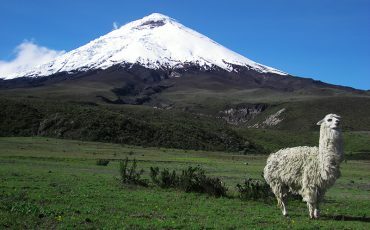 Trekking Activity Level.- Moderate, this adventure is at high elevation, make sure you drink a lot of water or coca tea, the trail is on dirt surrounded by bushes and grass. This morning we cross country – mountain bike from the Llanganates National Park down to the Pastaza River Canyon, enjoying the beautiful scenery of the cloud forest. The road brings us through some Andean farms and a beautiful canyon with many waterfalls. 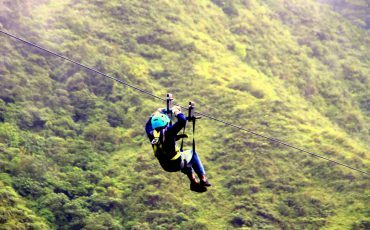 While descending into the jungle, we will have a breath-taking view of Baños, very well known for its spectacular location right on the foothills of the Tungurahua volcano, active since 1999, which is the main attraction of this region. In the afternoon we will have some time to explore the town and also go to The Swing of the End of the World, where the winner of the National Geographic 2014 photo contest took his picture. 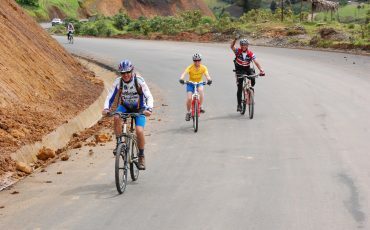 Biking Activity Level.- Moderate, mostly downhill, the first 45 minutes up hill and then just going down, you will be riding on cobblestone and dirt roads for the first two hours, and 1 hour on asphalt. NOTE.- In case you want to avoid the uphill, there will always be the support of our transportation, and our driver will be happy to give you a ride till you decide to join the biking group. This morning we will hit the road of the waterfalls. 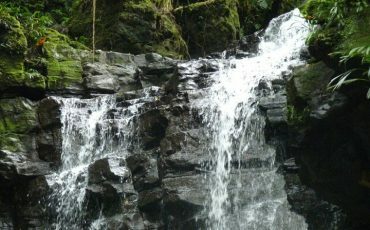 The first stop will be at the Bride´s Veil waterfall, where we will take the Tarabita (cable car) to get across the Pastaza River. Then we will hike down to the Pailon del Diablo waterfall, the second highest in Ecuador. Later, we will go deeper into the jungle inside the Llanganates National Park. The name “llanganates” comes from “beautiful mountain” in the local native language. 600 years ago, the Incas hid here their golden treasure. Explorers have spent many years looking for this treasure, but some have disappeared with no luck in this dense pristine jungle. During a hike through the Amazon Tropical Rain Forest, we will climb along several waterfalls. Our local native guide will tell us about the incredible nature and wildlife that live here. We will spend the night at the Local Basic Jungle Lodge run by a kichwa indigenous family. Canyoning Activity Level.- Moderate, the jungle exploration will be done while hiking on the canyon that has been formed by the waterfalls and river Pimpilala, so you will be hiking on irregular terrain on rocks and water surrounded by pristine Amazon Tropical Rain Forest, the weather can be hot and humid which would make a very refreshing activity, the highest waterfall to climb is 16 feet (4.87 meters) and the rest are smaller, we will use helmets, ropes and bring optional harnesses for people that want to use them. NOTE.- this is a very basic accommodation, you will have your room but will have to share the bathroom, the rooms are very clean and all the beds have mosquito net, there is no electricity in the room but there is a social area where you can have access to power to charge your batteries. We greet the day by preparing our gear to paddle the wild waves of the Jatunyacu River, located just a 5 minutes drive from the Homestay, the beauty of this river will inspire you and reveal the magic of the Amazon rainforest. After a very important safety briefing from our rafting guides, we will start our class III rafting expedition down the Jatunyacu River, well known for its clean water and awesome rapids. We will have a lot of fun playing some games and also exploring one of the canyons. The end of the journey offers us a stop for a picnic, prepared by our guides. We conclude our day with a drive back up to the Andes, stopping to visit the paradise of hummingbirds in Guango Reserve and finally continuing up to the volcanic hot springs resort, where we will spend the night. 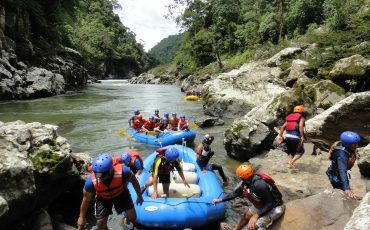 Rafting Activity Level.- Moderate, this is consider as a class III river for white water rafting, there is some awesome waves and also plenty of flat water to go swimming, the river is surrounded by amazing views of the Amazon landscape. 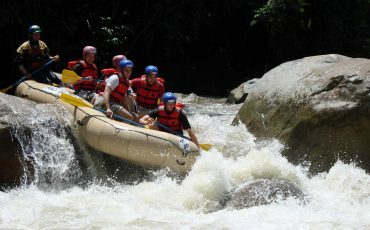 Rafting Time.- 4 hours, depending of the level of the water can be less time. In the morning we will do a hiking exploration in the nearby Cayambe Coca Ecological Reserve, there is beautiful flora that included colorful orchids, and while walking slowly and quiet you may see some beautiful birds too, later we will travel across the Andes to stop by the Equator line and have an explanation about this great attraction and for standing on both hemispheres at the same time, your guide will suggest a place to eat before going to Otavalo Indigueous Market and spend some time shopping and learning about this ancient culture that is still alive here. In the late afternoon we’ll be transferred to the hacienda and enjoy a welcome cocktail as well as a delicious dinner. Hiking Activity Level.- Easy, this adventure will be on a very nice trail along the river and that is surrounded by a Cloud Forest, in the early morning will be possible to have great views of the snowed capped Antisana Volcano, the trail can be a bit muddy so make sure you wear your hiking shoes. NOTE.- This morning if you do not want to go hiking, you can book a spa treatment and pay directly to the Hotel, make sure you organize this the night before just by calling from your own room to the Spa. 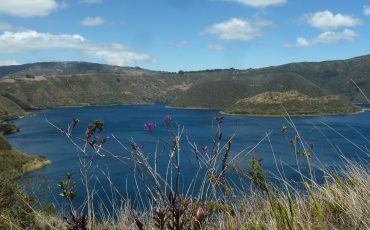 Today after a very healthy breakfast we have a very short drive to the Cotacachi Cayapas Ecological Reserve, one of the main attractions here, is the Cuicocha Crater Lake, and our adventure will take us on a trek around this still active volcano, your guide will show you lost of beautiful flowers along the trail. At the end of our hike, we will take a boat ride to the center of the crater to observe the activity of this volcano, watching bubbles coming up from the center of the caldera. In the afternoon we will drive back to Quito. In the evening we will take part of the farewell dinner with the guides and members of the group. 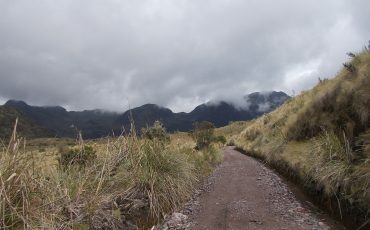 Trekking Activity Level.- Moderate, the trekking trail is on dirt sand and gravel, located in the Paramo Ecosystem at high elevation. Say your goodbyes to Ecuador – it’s time to catch your return flight. Or go on and head to the Galapagos Islands. 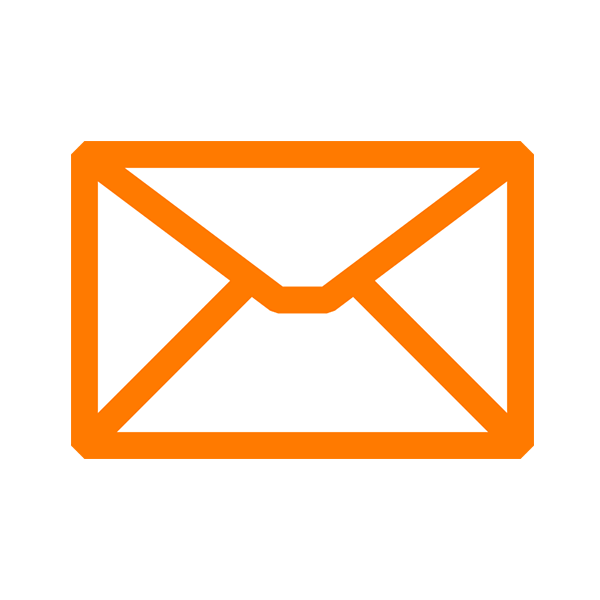 We would be happy to assist you on various available options! Select a month to view departure dates. If there are no departures in a month, the month will not appear below. Sep 08. – Sep 15. from US$ 1540,-p.p. Sep 22. – Sep 29. from US$ 1540,-p.p. Oct 06. – Oct 13. from US$ 1540,-p.p. Oct 27. – Nov 03. from US$ 1540,-p.p. Nov 03. – Nov 10. from US$ 1540,-p.p. Nov 17. – Nov 24. from US$ 1540,-p.p. Dec 12. – Dec 19. from US$ 1540,-p.p. Dec 22. – Dec 29. from US$ 1540,-p.p. Single supplement fee: USD $395,-p.p. International airfare to and from destination; meals not described; cost of medical immunizations as needed; trip cancellation insurance or any other travel insurance; cost of optional activities; excess baggage charges; airport taxes (if any); alcoholic beverages or soft drinks; optional gratuities to your guides; items of personal nature.